The B9Creator v1.2 HD 3D printer can be order and shipped throughout Europe as a kit or as a fully assembled, calibrated and tuned printer. 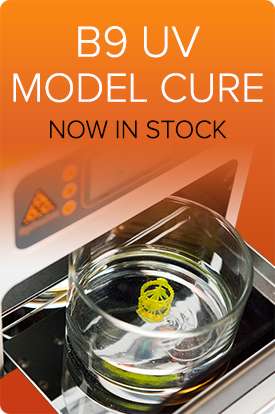 The kit has a lower price point and includes every part needed to assemble the B9Creator, including one resin vat. However, resin is not included with the kit and must be ordered separately. The kit does not include technical support other than the comments on the user forum on the B9Creator website. It is also important to note that proper assembly on a level surface is critical for the performance of the B9Creator. After careful assembly, the 3D printer must be calibrated and tuned. Overall, the assembly, calibration and tuning could take up to 14 hours. If you are interested in building the printer from the ground up, have time to spare and want to understand the construction process, the kit may be the right choice for you. For professional users that want to start printing quickly, the assembled machine is an outstanding value. It comes fully assembled, factory-calibrated and tuned by B9 technicians. The quality controls in place at the factory ensure the printer will work right out of the box and since all the work has been done, you can spend your time printing rather than building. In addition to saving time and assembly mistakes, this version includes one kilogram of B9 Cherry resin, two pre-coated B9 Vats, one calibration grid set and 1 hour of technical support in English over the phone. When adding all this together, the assembled version truly is worth the additional cost. 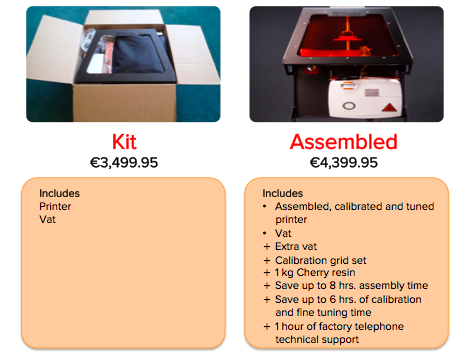 Whether you are looking for a do-it-yourself option or want to start printing as soon as the printer arrives, Redresins provides the printer and supplies for next creations!